What does camp have to offer my 3 or 4 year old? Working with 2-year-olds during the school year at Pierce I am often asked this by prospective camp parents. Why should I pay this much money to send my child to camp? What will they actually learn? Is it worth the money? Is it necessary? Having worked with this age group at Pierce for over 20 years I feel confident with my experience as an employee of Pierce as well as a camp parent to say YES it is worth the money and YES it is necessary. 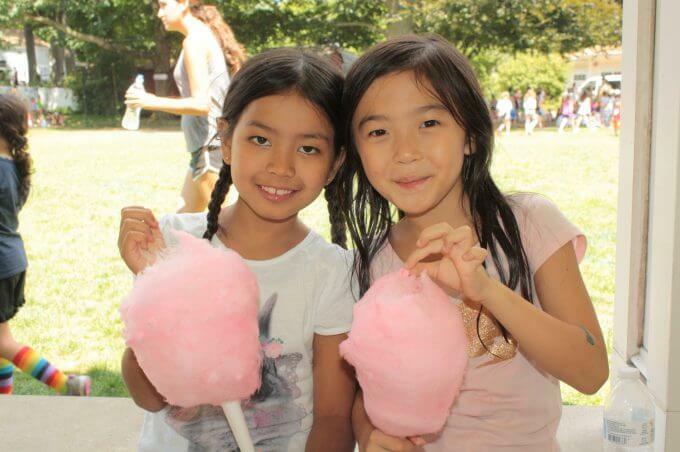 Pierce Country Day Camp is a warm and nurturing environment that prides itself on the social and emotional growth of children. This is clearly explained in their motto, “Children First”. Yes, children learn how to improve their physical abilities through athletics while they are here but in addition, their self-esteem is also fostered and nurtured. At the young age of 3 and 4 children learn how to build their confidence and develop independence at Pierce. Through their daily involvement in group activities and receiving positive feedback throughout the day for their achievements our campers learn to take pride in themselves. There is nothing better than witnessing a 3-year-old celebrating after mastering a new swim skill or watching them take pride in their ability to kick a soccer ball into the goal. These celebrations are acknowledged by the group which provides the child the experience of being part of a team and helps them to learn mutual respect and admiration. 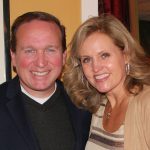 Keep in mind this is all achieved away from any connections to “screens” and independent of their parents. Young children of this age are so full of energy and curious about the world. Camp offers them the opportunity to explore and experience new activities in a safe, loving, and, of course, beautiful environment. Our staff is fully invested in understanding the growth and development of children so that they may reach their full potential. Each camper is treated as an individual with love and respect. Their well-being is our first priority. As a Supervisor, my job is validated when I hear a parent say during a camp visit, “Wow, I can’t believe this is my child!”, “They are so independent!”, and “They have grown so much!” It makes me proud to be a part of such a life-changing event for families. As I mentioned earlier, I am also a camp parent. I have witnessed my own three children grow and flourish at Pierce. The life skills they have learned at Pierce throughout the years you cannot put a price tag on. I do believe that the camp experience definitely helped to build their character while leaving them with memories and friendships that will last a lifetime. At Pierce, our campers can look forward to NEW and exciting programming from year to year as they “climb the ladder” with us. We want to share with you some of the big differences in our camp-wide program as our campers move up from our five-year-old groups and enter our six-year-old curriculum. At the age of 6, the boys groups have an all male staff: General Counselors and Group Leaders. Our 6’s move up to our beautiful Intermediate Pool with double chute water slides. 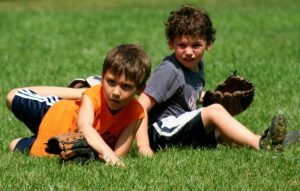 League Play – Our athletic program makes a significant jump forward with more intramural play! Bowling – Once every 10 days, our 6’s will enjoy a short field trip for bowling…They love it! 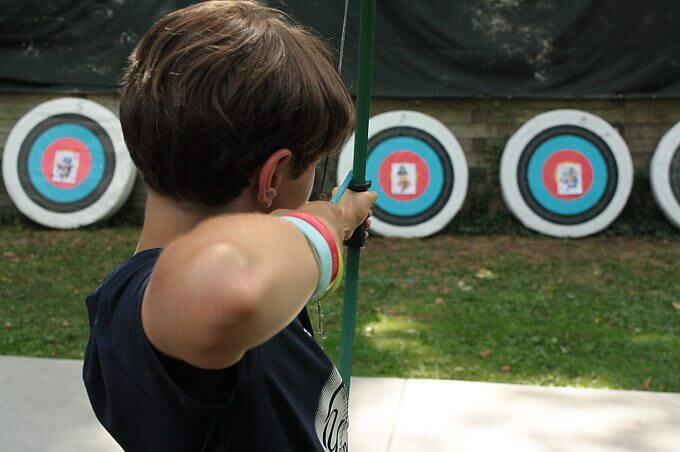 Archery – A camp favorite is now enjoyed by all of our 6’s! Cranium Club (S.T.E.M) – Air conditioned and very creative, our new STEM program has become hugely popular. Another creative offering this year is called CLUB TUNES! 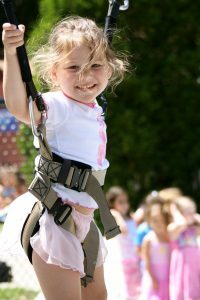 Bungee – Enjoyed by all… Now scheduled weekly for 6’s! The 6’s Pow Wow is now at night! Complete with our famous Jump Through the Hoop of Fire! One in every 13 children in the U.S. is affected by food allergies or intolerances. In a camp of 300 children, that means as many as 23 children may require special meal preparation. All food allergies are not created equal. If a child with a peanut allergy is exposed to peanuts, it is often a life-threatening situation requiring immediate medical attention. If a child with celiac disease is exposed to gluten, they will likely have abdominal discomfort and associated symptoms, which may not occur until 72 hours after the exposure. Handling food allergies effectively requires coordination of safe food handling, meal preparation, meal provision and dealing with exposure, so having a Registered Dietitian Nutritionist (RDN) is considered best practice. Only an RDN has multiple layers of nutrition education and is considered the expert in handling such serious nutrition issues. Many camps are staffing nutrition professionals to handle everything from meal planning to gluten-free meal preparation to carbohydrate counting for campers with diabetes. If you do not have a nutrition professional on staff, some basic facts regarding food allergies are included below. An abnormal response to a food triggered by our body’s immune system resulting in symptoms. An allergic reaction occurs when the immune system attacks a food protein that is normally harmless. The body responds by producing large amounts of histamine, which can result in symptoms that can be life threatening. These symptoms may include: swelling of the mouth, throat and tongue, difficulty breathing, lowered blood pressure and gastrointestinal distress. A true food allergy is not the same as a food intolerance. The term “food intolerance” encompasses any adverse reaction to a food source that is not caused by an immune response. The following eight foods account for 90 percent of all food allergies: peanuts, tree nuts, shellfish, fish, eggs, milk, soy and wheat. How many people do they affect? Nearly 8 percent of school-age children suffer from food allergies. How to provide safe meals? Prepare meals for those with allergies in a separate area using pots, pans, toasters and utensils kept for those foods only. Wash your hands and all surfaces prior to preparing meals. Use squeeze bottles for condiments to avoid putting contaminated utensils into a jar. Read all food labels; allergens can be found in many unexpected places, including seasonings and condiments. What do you do if accidental exposure occurs? Understand which allergy or intolerance you are dealing with. For allergies that result in anaphylaxis, epinephrine, in the form of an EpiPen, is the medication of choice for controlling a severe reaction. For milder reactions, an antihistamine may be adequate. For accidental exposure to gluten, there is often no need for intervention. Celiac disease is a delayed hypersensitivity reaction. Symptoms generally occur 48 to 72 hours after exposure and may present as abdominal pain, bloating, and/or diarrhea. Caring for other people’s children is an immense responsibility. Providing safe and healthy meals is one of the most important aspects of a safe and healthy summer. Best wishes for a healthy Camp Season 2016!